Expertly crafted, each timepiece created by New York fashion brand Coach is designed with contemporary style in mind. For the woman who prefers understated accessories, this classic timepiece is the perfect option. Featuring a gold tone case, tan leather strap and oversized indices, this elegant watch is ideal for daytime glamour. 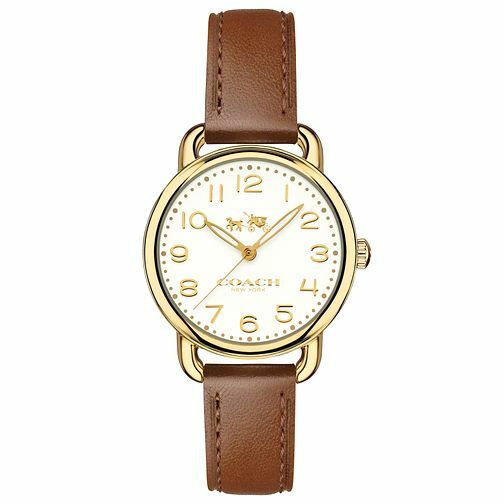 Coach Delancy Ladies' Gold Tone Strap Watch is rated 5.0 out of 5 by 1. Rated 5 out of 5 by Anonymous from Lovely little watch! Beautiful little wristwatch, fab quality strap and really comfy to wear. Neat size without being too small. Looks classy, timeless and perfect with jeans and a good tan handbag! Love it.